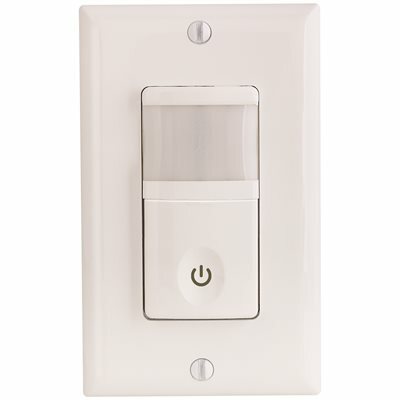 I wish to have a motion sensor on the lights in my garage, but I also want to have an override switch that works normally, and does not require a specific pattern to toggle the override in the sensor. The lights are 4x flourescent tubes in two double fittings, but I may add more later. Or may replace with LED fittings if that helps. For some reason these aren't available in New Zealand. Voltage is 230 VAC at 50Hz. the sensor will have live voltage on both sides even when the sensor is off. How should dual motion sensors be connected? (ground removed for clarity, actually it's needed at all devices assuming NZ code does not delete this popular requirement). And this is strictly a schematic, the wiring method must be such that currents balance in each cable or conduit. A quality, modern motion sensor with its own neutral isn't going to have a problem with its LOAD hot being externally hottified by a switch or other motion sensor. A maintainer, especially one who has looked around the room and observed motion sensors, should be shutting off power at the circuit breaker. I have no sympathy for someone who wants to work the circuit "hot", unless NZ Code has a variation that says I should. For all the servicer knows, it's wired with a switched neutral. I've done this. Works great. A switch and motion sensor in parallel. It also works with two motion sensors. Only thing is that highest takes precedence, in other words if the motion sensor turns the light on the switch is not able to turn it off. I tolerate this issue. A common component in automation is an HOA switch, which stands for "Hand - Off - Auto" switch. It's wired so that in the "Hand" position it's on, in the "Off" position it's off, and in the "Auto" position the controls (in this case the sensor) are determining the state. If you search for a HOA switch you'll find lots of switches that would work, but you won't find the type that you're used to seeing and using and looking at in your home. They'll be made to use on industrial control panels. If you search for a "SPDT center-off maintained toggle switch" you'll find switches that will work with regular switch boxes and cover plates. These will provide the HOA type functionality pretty close to what's built into the occupancy sensor / switch you are looking at. That should be functional; I'll have to leave it to the OP to determine whether it's code compliant in New Zealand. Not the answer you're looking for? Browse other questions tagged electrical wiring switch motion-sensor or ask your own question. Dual relay motion sensor, only one relay active?